Many of us have had a friend stay at our house while we were away to watch over our pets. Or we have been given the task. But, how many of us wrote an albums worth of music to gift to our friends upon their return? That’s exactly what Duke Garwood did while watching over Mark Lanegan’s five pets. Set up in Lanegan’s dining room, Garwood composed the music that Lanegan would later sing over. 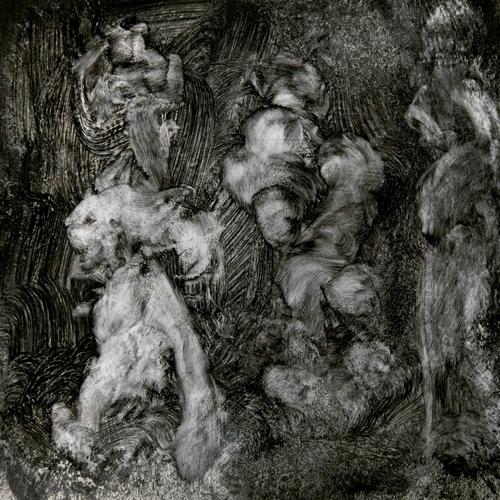 The sounds of Lanegan’s pets can be heard in the background of these recordings, providing the inspiration and title of the album. Lanegan and Garwood have collaborated extensively in recent years. Garwood played on Lanegan’s Blues Funeral (2012) and last years Gargoyle, but this album is the follow-up to the duos first full-length collaboration, 2013’s Black Pudding. However, With Animals is well, a whole different animal. Where Black Pudding featured a more guitar-centric baseline, With Animals is drum machines, synths, keyboards, and sampled sounds. Nevertheless, the two albums share a similar sonic aesthetic. Garwood’s instrumentation is sparse and ambient, giving Lanegan room to fill the empty spaces with his thick and haunting vocals. Where Garwood lightly coaxed melodies from his guitar on Black Pudding, here he has approached electronic instruments in a similar manner to deliver an album that isn’t especially electronic sounding. Garwood’s soundscape is delicate, yet firm. He draws up a sketch with paper and pencil, but by the end of the song it’s a full-blown mural consisting of various shades of gray and black. The results are hard to define. Ineffable, yet completely tangible. When the album opens with Lanegan singing “Come on now midnight children/sing a dark harmony” (“Save Me”) it is instantly gratifying as his voice looms against Garwood’s sounds. Throughout the albums 12 songs, Lanegan’s lyrics are simultaneously direct and mysterious. Which is the perfect match to the music. This combination transcends what the pair achieved on Black Pudding and solidifies them as perfectly matched collaborators. At times Lanegan’s vocals portray loneliness and despair, but Garwoods sounds give them a resonance that make them strong rather than weak. Songs like the title track, “My Shadow Life,” “Scarlett,” and “Ghost Stories” glide along a directionless wind, anchored only by Lanegan’s baritone. “Upon Doing Something Wrong” and “Desert Song” are built upon Garwood’s acoustic guitar picking, resembling something closer to one of Lanegan’s early solo albums. “L.A. Blue” is clearly a blues song, though it doesn’t sound anything like whatever you may identify with a “blues” song. “Lonesome Infidel” is almost acapella, save for Garwood’s obtuse and wandering synths and a distant whistling. The sparse instrumentation continues with “Spaceman,” featuring electric guitar and a shaker backing Lanegan’s folksy/gospel-like vocal melody. In summary, With Animals is a deceivingly dense album. At first blush, it’s a gentle and melancholic collection of songs. But, the more you listen and absorb the layers of sounds and meditate on Lanegan’s words, the more heavy and foreboding it becomes. Like fog hanging ominously in the sky, Lanegan and Garwood have produced an album that will sneak up on you. You should only fear resisting its undeniable power.